KUCHING –A group of concerned Sarawakians have formed the Movement For Change, Sarawak (MoCS) and it’s main mission is to work towards the betterment of the state and its people. Following 12 months of soul-searching and armed with resolute determination and genuine desire, the movement has adopted “Change We Can” as its slogan. Shades of Barack Obama. “Failure on the part of the people of Sarawak to do so would be totally irresponsible of them. The future of the generations of Sarawakians to come will largely depend on what we do and plan today,” Siah told reporters at the Kuching International Airport before leaving for Kuala Lumpur this morning. Siah, a veteran Sarawak editor, also stressed that MoCS is an independent movement and is not aligned to any political party. “However, we will be friendly to all parties and groups who are sincere and eager about doing the right thing for Sarawak. We will definitely work closely together with such groups and support their agendas irrespective of political alignment,” he said. Immediate plans and programmes of MoCs will be specially tailored to evoke changes “without fear or favour even if we have to tread on powerful toes,” Siah added. Noting that it was Ramadan, the MoCS leader emphasized that ultimately the people behind the movement will leave it to Allah/God to judge whether they have sinned against the state and people as they embark on their mission of change or whether they are able to encourage the ‘sinners’ instead to repent and turn over a new leaf. On the aims and objectives of MoCS, Siah said its priority was to strive for a new political culture in Sarawak – free from money politics, corruption, nepotism, despotism and free from politics of patronage and economic banditry. Secondly, it aims to strengthen democratic values and principles. Sarawakians must be made more aware of their rights in all spheres as citizens of a democratic, sovereign state and nation. MoCS will also provide a platform for Sarawakians who are apolitical to be involved in a mass movement which they can believe in – a movement which struggles for their religious, cultural and economic rights. And finally, MoCS will strive to educate the citizens of Sarawak of their duties and responsibilities in the governance of their state – that they have a stake in the state’s directions and future and to ensure that Sarawak is always managed and governed by leaders of integrity, foresight and high moral values. “The movement will also demand that only good and qualified candidates are chosen to stand for the elections. “If candidates chosen, either from Pakatan Rakyat or Barisan Nasional are deemed unfit, the voters will be duly advised to reject them,” Siah added. Asked who is backing the movement, Siah replied, “We back ourselves and finance the movement through our own pockets” adding that there were some prominent personalities who had endorsed MoCS. He also revealed that many Sarawakians residing in Peninsular Malaysia, notably in Kuala Lumpur, Johore and Penang, have pledged their support for MoCS. it’s indeed a good move. i’m glad to found out about this movement and will follow your progress. 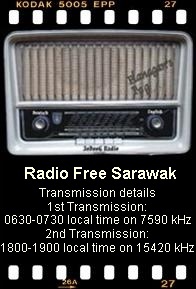 this is certainly a good newd for me, for us and all Sarawakian. i hope that i will be able to join and contribute soon. Good luck. Welcome to MoCS. Write to us at for more details. I think you guys should seriously to consider to set up a Facebook Page, so we can get update and also share this Page with our fellow friends and fellow Sarawakians. I really look forward for this movement of change. I have waited for too long and i hope sarawakians can be more much better and more infrastructure develop in rural area. and one more this i would like to know, why the semenanjung people be the big boss in sarawak instead of local sarawakians in government sector? mocs have any facebook or twitter? this movement is related to sarawak intrest or just for chinese sack? this MoCS is good ngo..hopefully it can make a change in sarawak..i like to join the rally but before that i like to know who will attend the rally..
Beware of too much sweet talk by BeEnd. They would say investigate after that they would keep quiet. They would not take action. A senior Malaysian Anti-Corruption Commission (MACC) officer yesterday refused to comment on the status of its investigations into graft allegations against Sarawak Chief Minister Abdul Taib Mahmud. Im one of you now. We want change and we want Sarawak “Independent” from Malaysia.